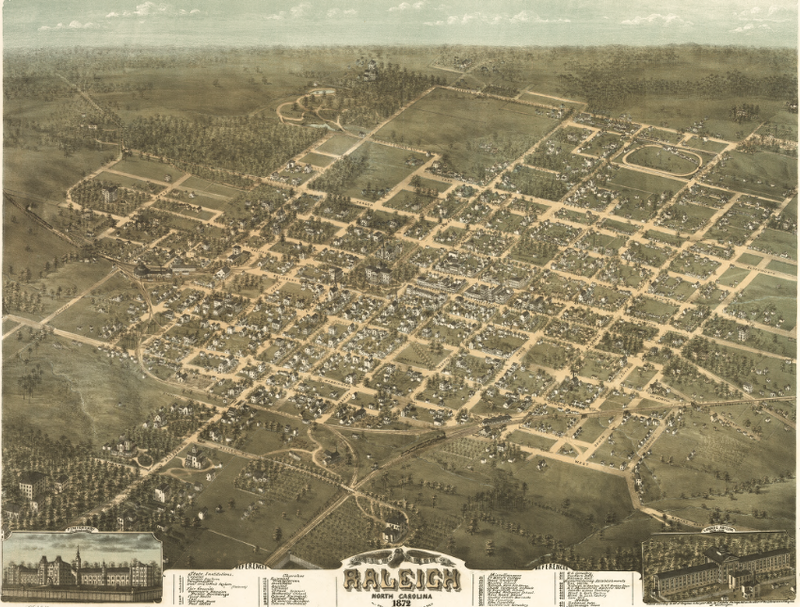 In 1872, Camille N. Drie set out to document the city of Raleigh, providing a “Bird’s Eye View” of the city. 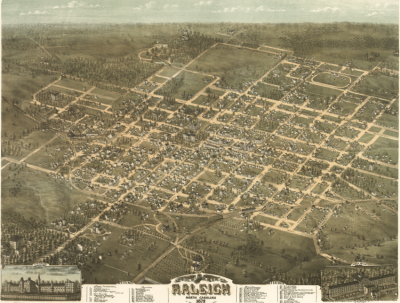 It was just a few years after the War Between the States, and back then Raleigh was a relatively small capital city in the South. Despite how it appears, his map was not drawn from a hot air balloon. Instead, he made a series of drawings from vantage points across the city and later stitched them together. 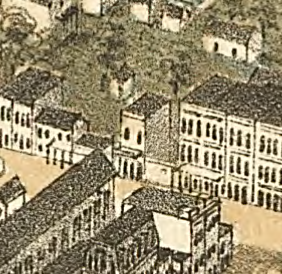 Although the intricately detailed drawing shows hundreds of structures across Raleigh, there aren’t many still standing. Project Bird’s Eye View is a new series in which we will document the remaining structures from this historical map and provide a small bit of history of the building over the years. The first entry is 227 S. Wilmington Street, now home to Slim’s Downtown Distillery. 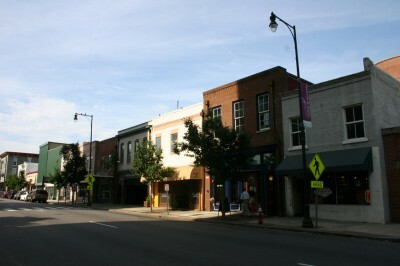 There is some disagreement as to whether Piedmont-style barbecue first gained a foothold in Salisbury, in Rowan County, or in Lexington, in Davidson County. 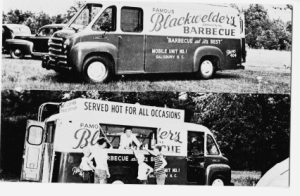 John Blackwelder of Salisbury is said to have added a barbecue pit to his taxi stand in 1918, one year before Sid Weaver erected his barbecue tent on Lexington’s courthouse square. 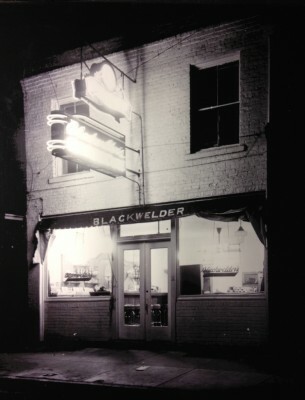 Although Salisbury is where Blackwelder’s got its start, there were also restaurants in Charlotte and other NC cities. 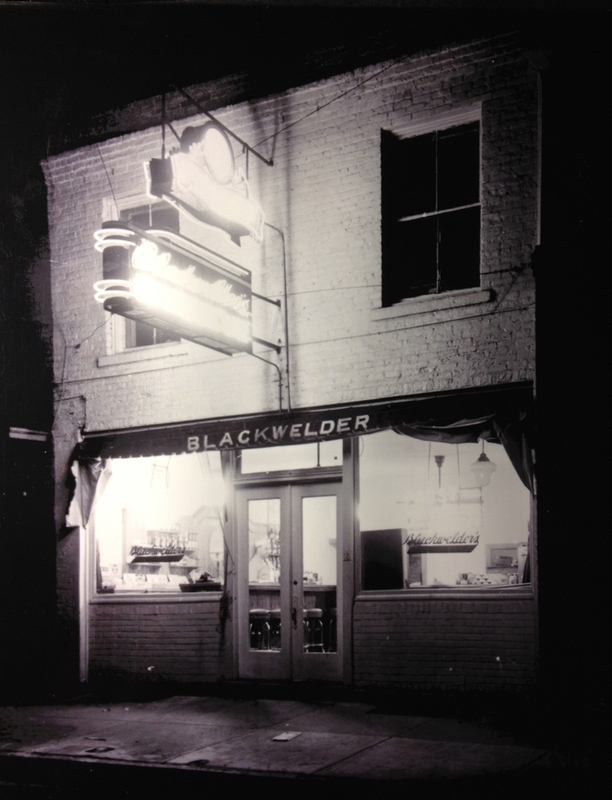 Considering that Blackwelder’s began as a mobile barbecue stand, it seems natural that they would later have several food trucks such as the one in the postcard above. 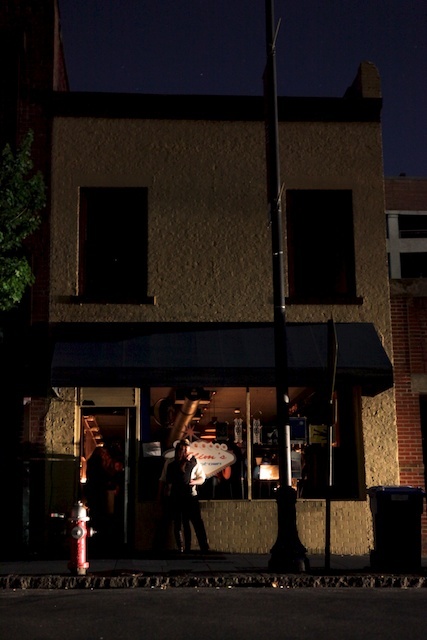 Current exterior view of 227 S. Wilmington St, as seen when powered by candlelight in the aftermath of the tornado. Today, 227 S. Wilmington Street is home to Slim’s Downtown Distillery, a bar and live music venue. 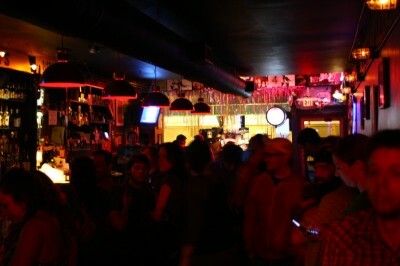 Slim’s is one of the earliest pioneers of the resurgence of the Downtown Raleigh nightlife scene. It seems fitting that such a fixture is in one of the oldest commercial structures downtown. It’s also one of the few places downtown where you can play pinball. I love the gritty character of Slim’s, and it’s one of my favorite spots downtown to get a beer. The next time you’re having a drink here, think about the fact that more than 120 years ago Raleigh residents also came here to buy liquor and other spirits. We will continue the Project Bird’s Eye View series (about once a month) until all of the remaining buildings from the original map have been documented. Oh Goody! I really look forward to this series. I had no idea this building was as old as it is and that it appears on this map. Thanks again, John, for making this my favorite Raleigh blog!!! This is so cool! SLIMS THEN!!! I’m sick of this PC stuff. Why doesn’t the article mention that Slim’s is one of the most successful gay bars in Raleigh? Very interesting stuff, looking forward to further entries. Boy George – think of it as a step up and over PC, why limit slims to being a bar for just one demographic. ^He was being snide & sarcastic. Back to the topic, I’m looking forward to this series…I’ve always wondered what buildings on that map still stood. Another interesting tidbit on this building is from 1976. This building was used in a Raleigh Police sting operation. RPD ran an “Adult Book Store” in this building at 227 South Wilmington St. while buying stolen property. An officer from NY was hired by RPD to run the business which operated for several months. I was a young SBI agent at the time and my job was to set up the surveillance camera to record the transactions. The RPD officer who ran it lived in the same apartment complex as I did and I would deliver the photos to him at homeevery couple of weeks. The visits to the store for a new young SBI agent were eye opening to say the least. I still have a business card from the book store and if I can figure out how to upload it I will include it.